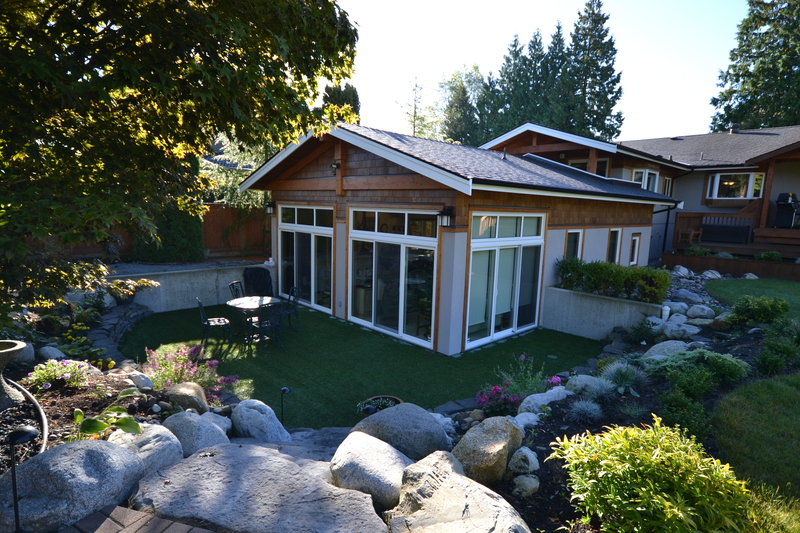 This 900 square foot in-law suite addition was designed and built by Tamlin Homes. As regulations where this suite was built stated that the building must be attached to the main house there were design considerations to conform to those bylaws. Architecturally, the objective of the in-law suite addition was to maintain a completely seamless extension to the main house, while providing for an independent life style. As a barrier free design, all doorways are at least 36” wide and the unit is accessible by way of a ramped walkway to the entryway. Rather than having a towering building in the backyard, this addition was sunken to match the existing basement level. However, to allow a bright and open atmosphere a low level rock garden with huge walk-out patio surrounds the unit. This in-law suite was meticulously designed with the owners in mind and will allow for many years of enjoyment.